has taken time out of his busy schedule to appoint us his Welsh agents. Raw talent is often discovered by accident and never a truer word may be spoken. Not toward the discovery of an artist but the artist's discovery of music and his talent for it. Six years ago the Welsh born JAY JAMES had never sung or played a note in his life. Today, Bill Withers, Booker T Jones, Justin Timberlake and John Legend are among the many admirers of his uniquely soulful voice. A voice that was discovered entirely by chance. After joining the Royal Navy at the tender age of 16, Jay James trained and served as an Above Water Warfare Specialist before becoming a Physical Training Instructor, a highly demanding yet respected career move. Jay James played representative rugby, football and cricket. "My entire life had been about sport," says Jay James, "Sport and hitting the town with my mates". It was one such night, New Year's Eve in fact, that prompted Jay James to make a drunken bet with some fellow sailors as they walked past a music shop in Portsmouth. Five minutes on and thirty pounds later, Jay James was walking the streets with an acoustic guitar. For months it sat unplayed in his living room until a rugby injury on the eve of a big game found him home alone, with his flatmate (and best friend) posted overseas on active duty. Feeling low and awaiting an operation on his ruptured knee cartilage, he googled guitar tutorials and began to teach himself to play. By the time his flatmate returned from Afghanistan, Jay James had learned a handful of songs and started to sing along as well. But still no-one had heard his incredible voice. "My best friend knew I had no interest in music, so he refused to believe I could play or sing until I proved it. A startled flatmate compared him to Al Green and Jay's musical education began that day. He had just discovered his voice, albeit by chance. His songwriting emerged soon after, when a long relationship with his childhood sweetheart began to fall apart. 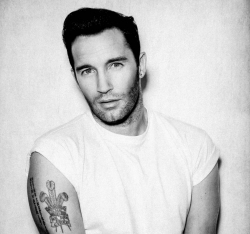 Jay James is not the archetypal soul singer. Jay James' startling vocal range and power conjures up ghosts of soul legends like Otis Redding, Al Green and Marvin Gaye yet his approach feels refreshingly different. Having only really discovered music since fate brought him to it just over a matter of years ago, he knew and rarely knows anything of the legends he should. He has no influences, only that of which his head, heart and experience guide him. Whilst performing, that is clear. He creates the moment, his heart fuels the emotion whilst his voice tells the story. He is reminiscent of the 'Old School' yet his honest and stubbornly unaffected naivety puts him in a new class, potentially of his own. You see unlike many others, Jay wasn't born into music, it would seem music was born into him. With his Musical & Artistic talents starting to attract widespread genuine excitement both in the States and the UK, bloggers are hailing Jay as the 'Male' answer to the Grammy Award winning ADELE. Showing honest reflections of an artist and songwriter well before his years, with experience and a clear knack for translating his "hard-hitting, fiery heart" into song, he is sure fire 'HOT PROPERTY' & 'ONE TO WATCH'. After collaborating with mentor, Grammy Lifetime Award achiever Booker T. Jones (Booker T & The MGs) on 'Play it by heart' Jay's UK debut. In the Summer of this year Jay featured on Bookers largely anticipated Stax Records return with Album 'Sound The Alarm'. The song 'Broken Heart' with Jay was Bookers first single off the Album featuring the likes of Anthony Hamilton, Mayer Hawthorne & Estelle to name a few. 'Broken Heart' became an 'Instant Classic' according to BBC Radio 2 DJ's Chris Evans & Steve Wright and the song since has become Bookers biggest UK radio hit since 'Green Onions' having sat at Number 1 on the Radio 2 A-list for a whooping 5 weeks and remaining play-listed at the station for a further 4 weeks, the song is still in massive rotation around many Radio stations across the UK & the US. Jay also won a fan of Soul Legend Bill Wither after performing the track at Booker's Album launch 'Live at The El Rey Theatre' in Hollywood, LA in June this year! The performance was Televised across America on AXTV, sparking even more interest and demand for Jay James's US debut. The song is now expected to become Bookers 2nd US single from the Album. & release of 'Play it by heart' Jay parted ways with the record label Decca Records after feeling they had creative & direction differences, regardless 'Play it by Heart' became 'Critically Acclaimed' in many of the UK's Commercial & Music Press. Jay is currently working on Album 2 Stateside with Cocaine 80's frontman, James Fauntleroy, The Underdogs and R&B Heavyweight Tank to name a few. He has also sparked the attention of Justin Timberlake & Producer Timbaland who expressed their interest to sign & work with the young Welshman on his US debut.